The funnest part about fashion is indulging in versatility. One day I'm in a casual safarish outfit and the next I'm prim and proper in a fit and flare polka dot dress! 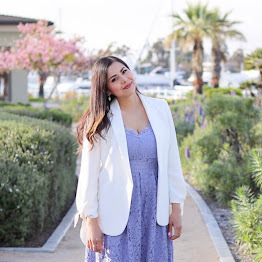 The back story: I had ordered a cute Dorothy Perkins dress for my friends' wedding but due to it being international shipping (which I didn't know at the time) the dress didn't make it in time! What to do? I ran into Forever 21 like a maniac and I magically came across this dress. When I tried it on I was sold! It's fitted (check! ), elegant (check! ), polka dots (double check!) and has pockets (bonus check!). The fit-and-flare dress has a flattering and elegant silhouette and it reminds me of something Betty Draper would wear. Because of the pattern, I kept the accessories to a minimum with these pearl string earrings and this cuff from the Ann Taylor event goodie bag. I love this look on you so much! You look elegant and classy. I'm surprised it's from Forever 21 actually...such a great find!! 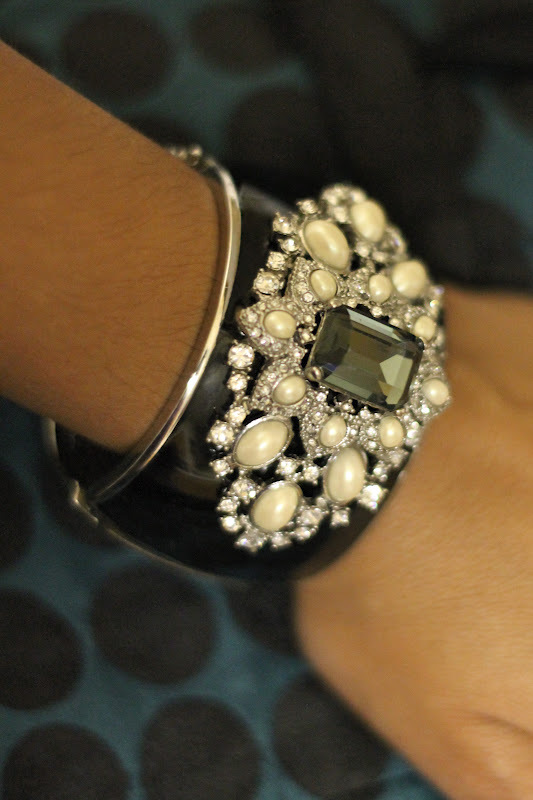 The Ann Taylor bracelet pairs perfectly for this dressy occasion! So elegant perfect for a wedding! You are so gorgeous in this dress! You look stunning and what a beautiful dress! Lovely dress, you look beautiful! :) I think we've all had to buy a last minute outfit because a delivery hasn't arrived on time haha, I know I have! this is so cute and the hair goes PERFECTLY! You look very elegant and sophisticated in this dress. It fits perfectly! I have to agree with you that versatility is one of the funnest things about fashion. Your outfit can completely change your look! That dress is beautiful! And that hair bun is so fantastic. I love how you can easily change this up and make it fun and casual too! You look beautiful. one word...LOVELY! I totally adore it! looks so good on you! You look so pretty! I love your hair and dress! Adorable! In love with this dress! I like your outfit. Your smile is perfect! This is my blog: tanaltocomoquieras.blogspot.com You can check it out. You are like me and work GREAT under pressure when I plan an outfit it doesnt go accordingly but when I am in a hurry or pressed for time I pick something good, This dress looks much more exp than F21 so classy and gorgeous. That dress fits like it was made just for you!!!! Forever 21 for the save!!! I love this on you! You look fab! You are my inspiration girl! You look perfect and fabulous, nothing less! Love the dress and you were so lucky! Good job chica! wow! Looooving the dress and that arm candy! Hopefully you'll check out my blog too -- would love it if you'd like to follow! Hope to see you around soon! I am actually speechless! You look so amazingly beautiful! This dress suits you so well and you styled it perfectly with the pearl earrings and the cuff! Your top bun adds a polished effect to the look! Very chic! Omg! OMG! O M G!!! My dear you are amazing!!! wow, very elegant indeed, f21 has so many surprises!!! love ur hair in a bun, very audrey hepburn!!! FAB forever21 find!!! you look amazing in this dress! Honey you look stunning!!! From head to toe perfection.